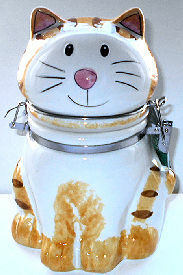 This orange striped kitten is a canister. Use in your kitchen to store baking ingredients or for kitty treats. The ceramic canister is 7" high x 4 1/4" wide x 4 1/2" deep. Notice the secure locking hinged lid.